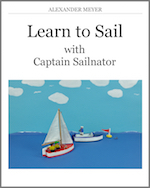 You want to join a sailing course or you have already passed a certification and you now ask yourself what comes next? 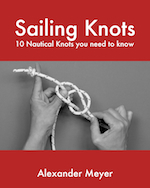 How does it go on and what can the prospective skipper or crew expect? 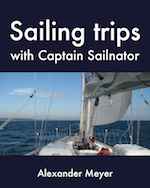 I describe some of my sailing trips for you in my book and ebook: “Sailing trips with Captain Sailnator” as an encouragement. By reading it you get an impression how such a trip could be like and what might happen underway. From being crew the first time when sailing around Mallorca to a big trip across the Baltic Sea, from skipper training to being co-skipper on a big sailing school yacht everything can be found. I talk about sailing under blue sky and in fog, of experiences in doldrums and near-gales, of the visit in beautiful harbours and romantic anchorages, of adventures with slipping anchors and big waves, of the fight against seasickness and against the humidity and the narrowness on board, of the camaraderie and the growing together of the crew, of encounters with dolphins and Portuguese man-o’-war and of the wonderful feeling to be at sea. The reports reflect the daily routine on a yacht authentically. Harbours and anchorages are mentioned by name so that you can follow all the trips on a map. With the attached photos you get to know the respective areas visually. I wish you a lot of fun by reading the book! And maybe we see each other once out there – on the roaring sea!